I’ve been going to Upper Canada Village since I was a child. It’s a historical recreation of a rural English Canadian village from 1860’s along the St. Lawrence Seaway. Most of the buildings are authentic to the time period, although I don’t think there was ever an actual village on that site — the buildings were moved in from a number of different sources. Needless to say, it’s an educational gold mine. Not surprisingly, it was a popular spot for school field trips, and my parents also took my brother and I there on summer outings. However, back when I was a kid they didn’t have the two lights festivals that they do now (Pumpkinferno for Halloween, and Alight at Night for Christmas). I’m pretty sure they didn’t host the medieval fair in the summer there either. These are all great events, though, even if they’re not exactly time-period-accurate. 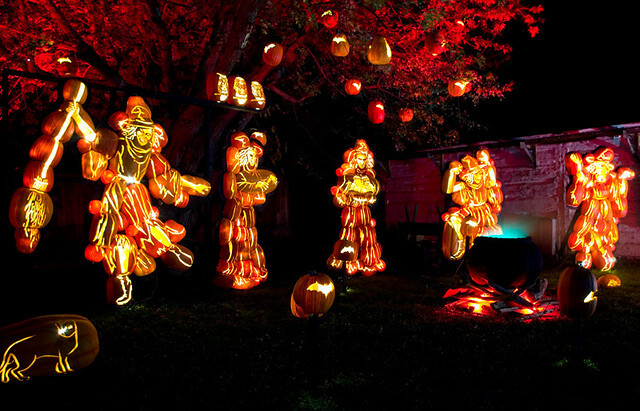 Pumpkinferno is an exhibition of 7,000 hand-carved pumpkins along a kilometer-long walking trail. 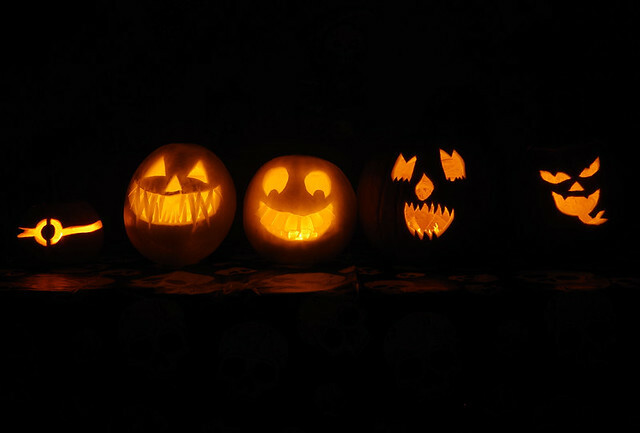 The majority of the pumpkins are artificial, since the exhibition lasts for about a month and no real pumpkin would last that long. There are some real pumpkins painted (and in previous years, carved) by local children on exhibit as well. Back when they used carved ones they had to keep switching them up for new, fresh gourds, which is probably why they switched to painting. I’ve been going to Pumpkinferno since the very first year (five years ago or so), and as my kids got older I started bringing them along as well. This year was Thing 2’s first time attending. 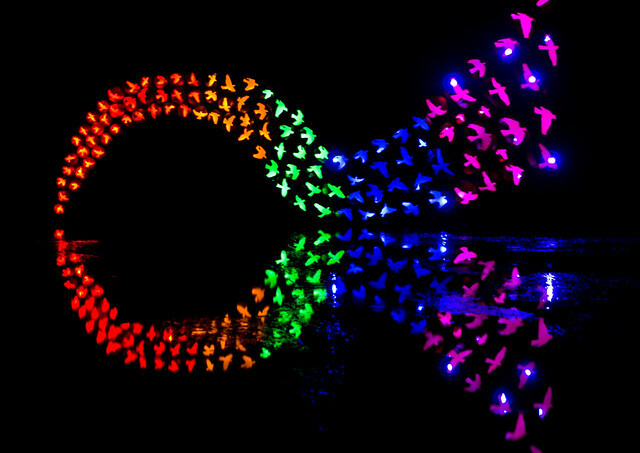 There was also a rainbow ribbon made of birds (doves?) in the mill pond. Only the top half of the ribbon was actually made of pumpkins; the bottom was a reflection. Witches danced around a cauldron to a recording of the witches’ chant from Macbeth. These witches seemed more Pratchett-like than Shakespeare-like to me, though. 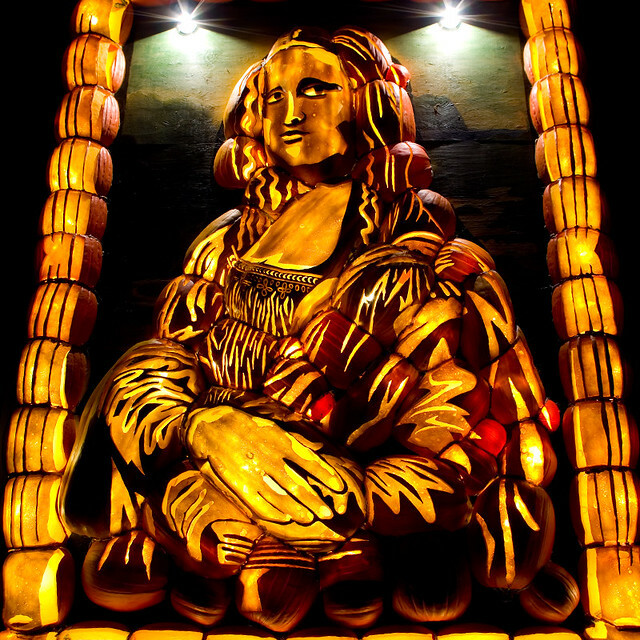 There was a whole section of famous paintings recreated in pumpkins. The most recognizable, of course, was the Mona Lisa. There was also Van Gogh’s self-portrait, Emily Carr’s Haida Totems, Girl with a Pearl Earring, American Gothic, White Pine by A.J. Casson (Group of Seven), and a Frida Kahlo self-portrait. In honour of the village itself, there was an exhibit called the “Upper Canada Village People”, of which there were a schoolteacher, a cheese-maker, a baker, and a spinner. 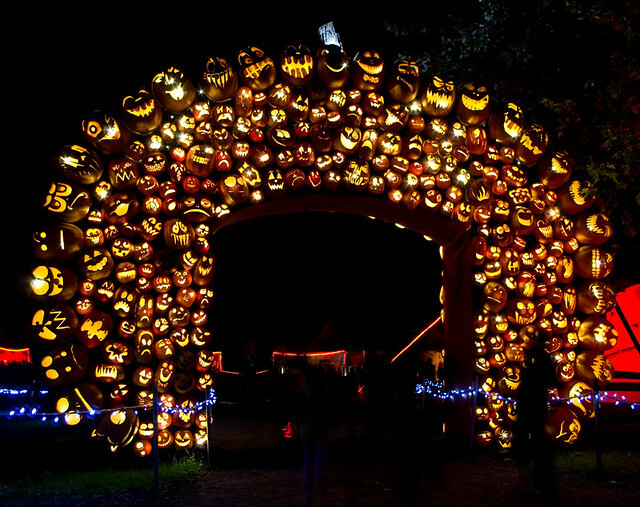 The Jack-o’-lantern-covered archway to the children’s area is another exhibit that has remained constant (although I believe at least some of the individual pumpkins have changed). My favourite part this year was the Day of the Dead area, which was actually so large that I couldn’t fit all of it (or even most of it) in one picture. 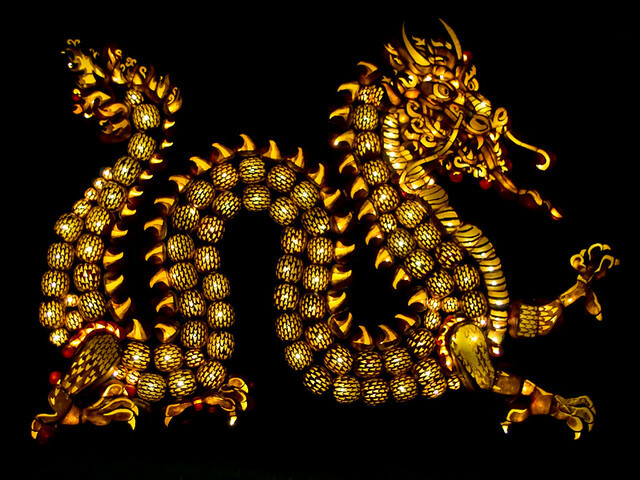 It was colourful and detailed and a general pleasure to behold. 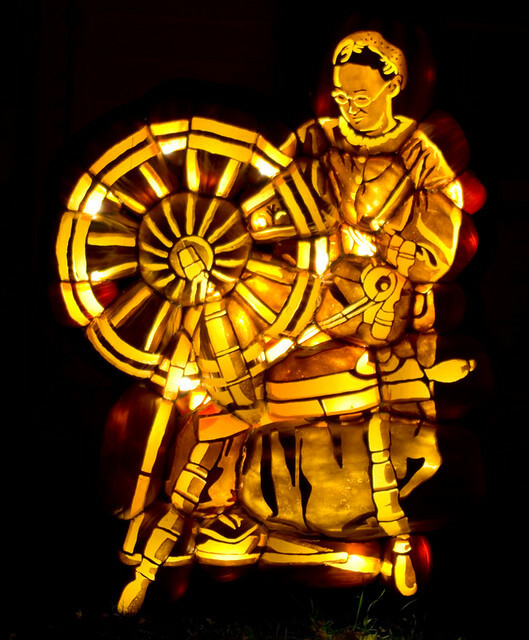 Of course, these aren’t all of the exhibits at Pumpkinferno — they’re just the ones of which I got the best pictures. 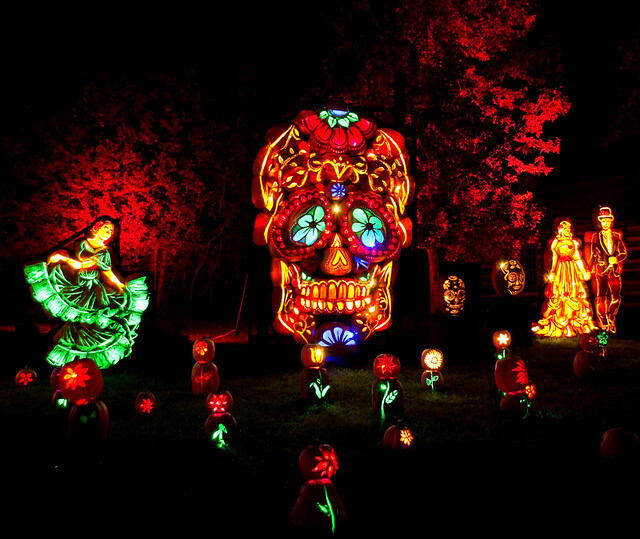 If you have time before Hallowe’en, I highly recommend a visit. It only runs Thursday through Sunday for the next two weekends, so keep that in mind when you’re planning. Also, the lines for entry can be quite long. I highly recommend buying your tickets online in advance, which means you get to take the quicker and shorter line, and spend more time inside the event.